Police are on the hunt for the driver of the van that rammed through a crowded tourist area in Barcelona Thursday, killing 13 people and wounding more than 100 others in what investigators called an act of terror. At least two people have been arrested as suspects in the attack, according to the regional president of Catalonia. One of the suspects is a Spanish national from Melilla, and the other is a Moroccan citizen who lived in Spain legally. Oukabir rented the van that was used in the attack, according to El Pais. A government official has confirmed to Fox News that intelligence agencies are now combing through their holdings, including terror watch lists, to determine if Oukabir was known to the FBI, DHS and other agencies. Officials are also working to determine if the suspect was blocked from entering the U.S., or if this was a radicalized individual that was not on government radar. 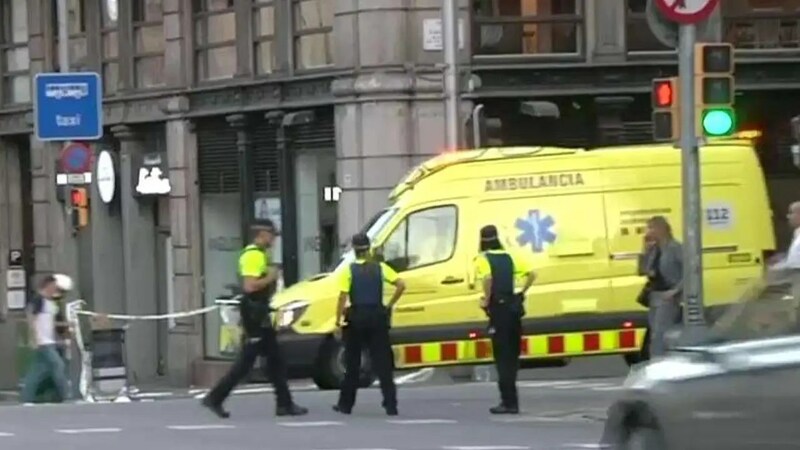 The white van jumped onto a sidewalk and sped through a pedestrian zone on Las Ramblas of Barcelona, the famous main pedestrian walk way that crosses the city. The van swerved from side to side as it plowed into tourists and residents. State-owned broadcaster RTVE reported that investigators think two vans were used — one for the attack and a second as a getaway vehicle. Speaking from Panama, Vice President Pence called the day “tragic.” He acknowledged that ISIS took credit for the attack, but said “whoever is responsible should know, together with our allies, we will punish those responsible” and rid “Islamic terror” from the world.